7 July 2005 witnessed the deadliest single act of terrorism in the United Kingdom since Lockerbie (search the article), and the deadliest bombing in London since the Second World War. At 8.50am on 7 July 2005 a bomb exploded on a packed underground train on the Circle Line about 100 m (328 ft) from Liverpool Street station as it headed for Aldgate. Within less than a minute, bombs also went off on an underground train which had just left Edgware Road and was heading for Paddington, and on a Piccadilly Line train, travelling between King’s Cross St. Pancras and Russell Square. At 9.47am an explosion occurred in Tavistock Square on a number 30 double-decker bus, travelling from Marble Arch to Hackney Wick. The bombings were the first to be perpetrated by suicide bombers in Western Europe. 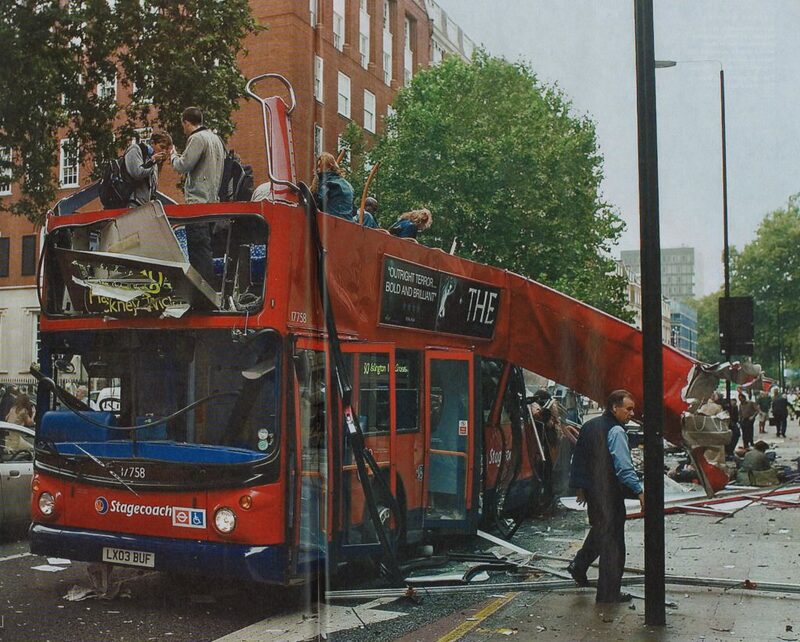 The Edgware Road bomber was Mohammad Sidique Khan, the ringleader and eldest, who killed six people; the Aldgate atrocity, which caused the deaths of seven, was carried out by Shehzad Tanweer; Germaine Maurice Lindsay was responsible for murdering 26 people on the Russell Square tube, and Hasib Mir Hussain carried a bomb that killed 13 people on the number 30 bus. Earlier that day Khan, Tanweer, Lindsay and Hussain picked up their bombs from a house in the Burley area of Leeds and drove to Luton in a red Nissan Micra, hired a few days earlier by Khan. They boarded a train to King’s Cross, arriving at 8.26am, before each went on their separate deadly missions. It is believed that Hussain had intended to get on to the Northern Line but discovered it was suspended that day due to a defective train at Balham. He was captured on CCTV on the concourse of King’s Cross station after the other bombs had gone off, and mobile phone records indicated that he had tried to call the other bombers. About 50 minutes after the other bombs had exploded, Hussain boarded the number 30 bus, and shortly thereafter detonated his bomb. The remnants of his skull, driving licence and credit cards were discovered in the wreckage of the bus in Tavistock Square. In total 52 people were killed and more than 700 injured. A second plot failed on 21 July 2005 and the next day the police shot an innocent Brazilian electrician Jean Charles de Menezes by mistake.